I’ve been selected to participate in Totally Tutorials Free Supplies for Tutorials Exchange, and K & C Supplies is the gracious sponsor for this event. Thank you Totally Tutorials for making the connection! I’m so excited, because I just received my supplies today! If you love to sew, and need zippers, buttons, or zipper pulls click on the K&C Supplies link above, you wont be disappointed. 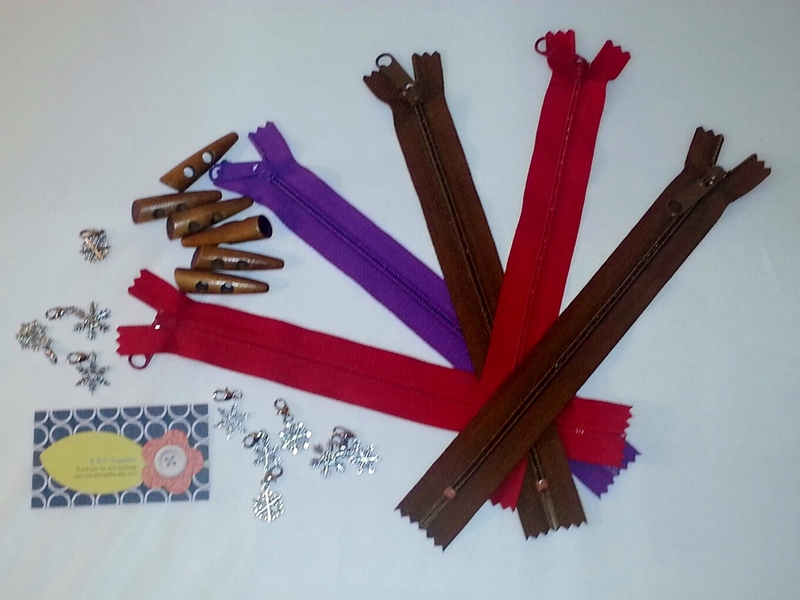 Take a look at what I received: Five 9″ zippers, toggle buttons, and my absolute favorite…… snow flake zipper pulls! Can you guess which tutorial I will share? I shared a hint last week…. Previous Post Animal Prints- Is it a Hit or Miss? Next Post E-Tablet Clutch- Is it a Hit or Miss? Can’t wait to see and what fabric you use! How exciting, love those little snowflake charms. The charms are definitely my favorite!